A revolution is in the air. The French are angry. And completely fed up with their politicians. Today, during the ceremony in Nice to pay homage to the 84 people mown down by Mohamed Lahouaiej-Bouhlel, the French prime minister, Manuel Valls, was booed at before and after a minute’s silence. There were also shouts of “Murderers!” as Valls and two other ministers left the seafront where an enormous crowd had gathered. Some held up placards calling for the resignation of French president, François Hollande. Since the tragedy occurred, there has been intense debate about whether the government has done enough to respond to terrorism in this country. At the very end of this video below, you hear a woman yelling from her window down into the street as Valls walks by. Monsieur Valls…faites quelque chose ! Y’en a marre ! Nos enfants sont morts ! 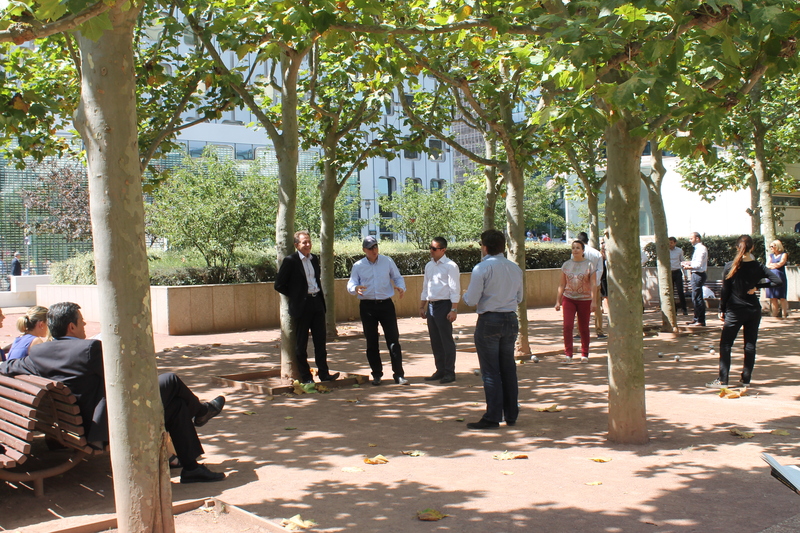 Mr. Valls…do something! We’ve had enough! Our children are dead! I’m happily planning my August trip to my most favourite city in the world, LONDON. So much to see! So much to do! If I could, I’d live there. But it’s an expensive city. And I have a good job in Paris. It would be foolish to leave. I did live in London, all throughout 2005. It was a memorable year. I worked, I met new people, I stayed in a friend’s house in Fulham while she was in Africa for a year. I explored the city and had a lot of laughs with my friend Sherry. I enrolled in a photography course at Central Saint Martins, London’s college of art and design. It was an evening class and I used to love riding home at night, back to Fulham, on the number 14 double-decker bus. I’d always sit up top. Anyway, while searching the internet for plays, exhibitions and concerts to attend, I came across this – Take Me to Neverland: Peter Pan from Play to Book and Beyond. Reading Peter Pan and watching the TV movie with Mary Martin playing the lead role was one of the defining moments of my childhood. So I’ll go to this exhibition. Using the magical collection from Great Ormond Street Hospital, Take Me to Neverland: Peter Pan from Play to Book and Beyond tells the real story behind Peter Pan. Discover the origins of JM Barrie’s Peter Pan, from the success of the 1904 play to the many adaptations that have continued to inspire both children and adults over the past century. Great Ormond Street Hospital for Children has been closely associated with Peter Pan since Barrie gifted the copyright to the hospital in 1929. Since then, the timeless story continues to help make the hospital the incredible centre of hope it is today. The exhibition will include early editions with classic illustrations of the story including works by Mabel Lucie Atwell and Arthur Rackham, and Peter Pan’s Postbag, a collection of children’s letters sent to Peter Pan from 1906-14. Also on display is one of the original bells that was used as the “voice” of Tinker Bell in the 1904 play and a selection of Peter Pan memorabilia never before displayed in public. Stay tuned for new London posts in August. To look at old London posts, go to the very top of this page and type “London” into the Search box. PREVIEW – Here’s another museum I plan to visit. There’s a current exhibition called SWEPT UNDER THE CARPET. SERVANTS IN LONDON HOUSEHOLDS, 1600-2000. There are also beautiful gardens to walk in, a café and gift shop, and a permanent exhibition of Period Rooms. The Geffrye explores the home from 1600 to the present day. Evocative displays of London living rooms and gardens illustrate homes and home life through the centuries, reflecting changes in society, behaviour, style and taste. Set in beautiful 18th-century almshouse buildings, the museum is surrounded by gardens – a much-loved oasis in the heart of inner-city London. The Avignon Festival is held every July in the courtyard of the Popes’ Palace, as well as in other locations around the city of Avignon. Founded in 1947 by Jean Vilar, it is the oldest theatre and performing arts festivals in France…and one of the world’s greatest. This is the play that everyone’s talking about right now. Direction is by Ivo Van Hove, artistic director of one of Europe’s most inventive theatre companies, the Toneelgroep in Amsterdam. Actors are from the prestigious Comédie Française troupe. 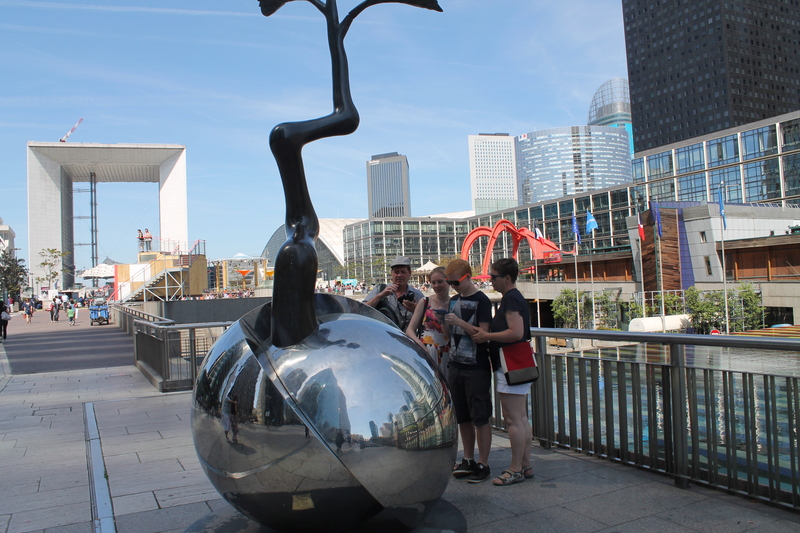 THE DAMNED will be televised live from Avignon this Sunday night (July 10) at 22h50 on France2. Here’s the story – To protect their interests as Nazism triumphs in Germany, the steel tycoons of the fabulously wealthy Essenbeck family see no other solution but to ally themselves with the new regime and murder the patriarch, old Baron Joachim. Intrigue and machinations, betrayals and murders: the appointment of the new head of their steel empire will turn into a ritual of Evil in which the corruption of the relationships between individuals echoes the cruelty and brutality of the political context. In this struggle for survival and against all odds, it is Martin – the incestuous and paedophiliac progeny of powerful Baroness Sophie – who will manage to eliminate all his opponents and become a zealous servant of the regime, ready to reign on the empire he inherited. He will, however, have to pay a high price, living a cold life irremediably devoid of love, goodness, and beauty. If you click on this link below, you’ll find a good and comprehensive list of hotels, B&Bs and campsites in the region as well as restaurants, markets, etc. 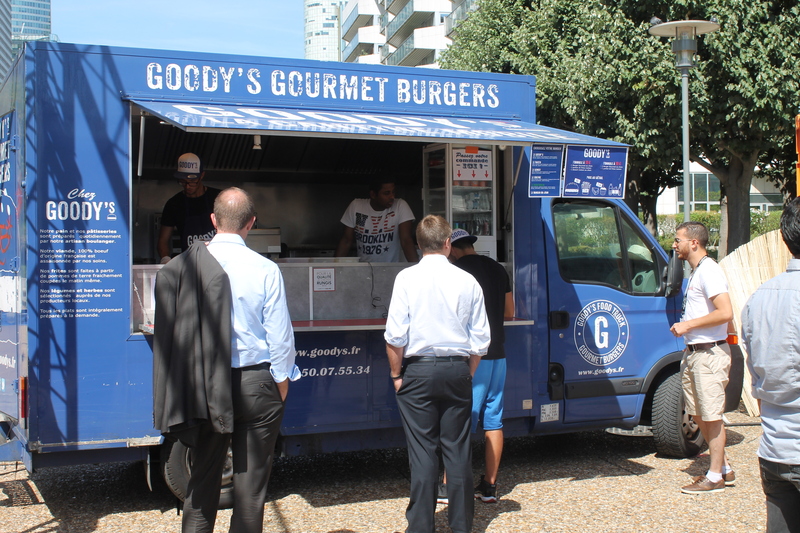 Let’s face it, the French are snobs, especially in terms of food. But the good news is there’s a faction now who are less snobbish because they’ve lived in London, New York, Montreal, Sydney and other cities. This experience has made them far more receptive to new and different ideas. 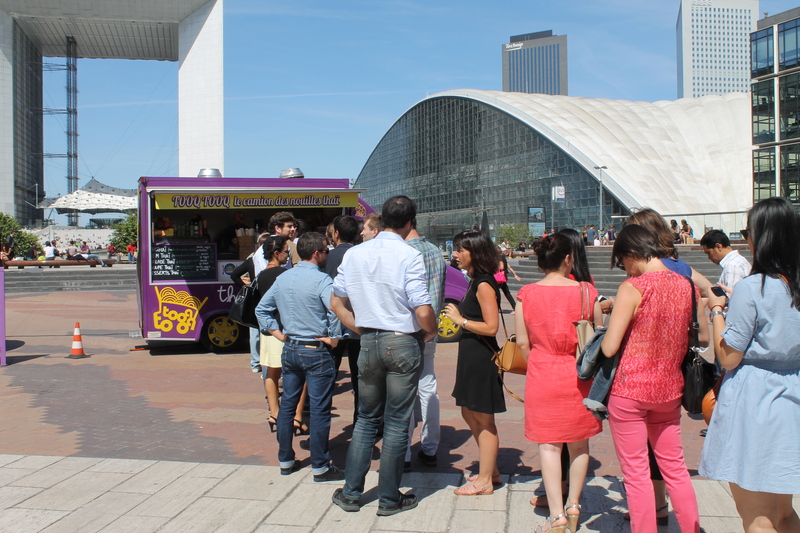 These photos were taken last August at La Défense, Europe’s largest business district on Paris’s west side. I now work here. 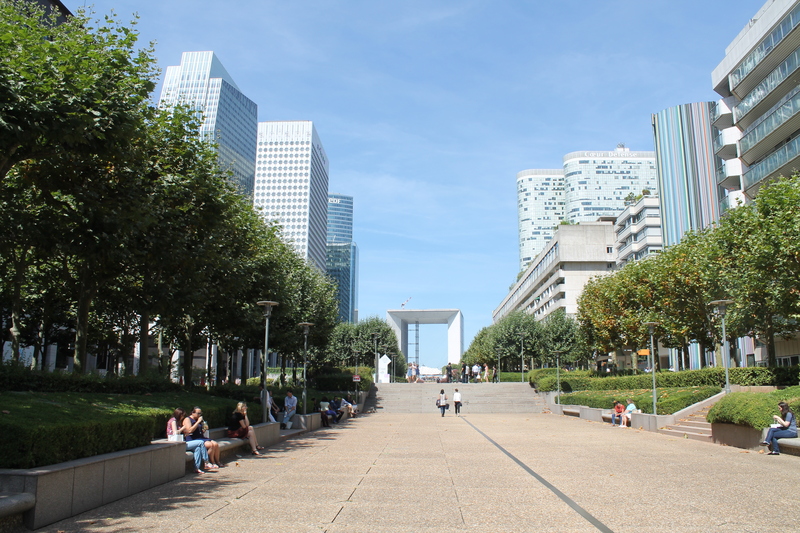 The Esplanade de la Défense, the long walkway lined on either side by trees, apartments, restaurants and skyscrapers, is dedicated entirely to pedestrians. 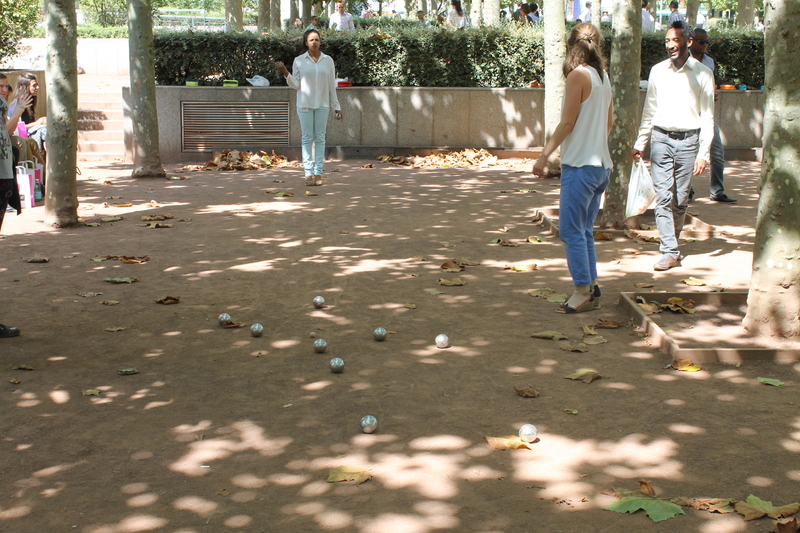 It’s a pleasure to stop at the many shaded squares along the way and watch office colleagues playing boules (pétanque) on their lunch hour. 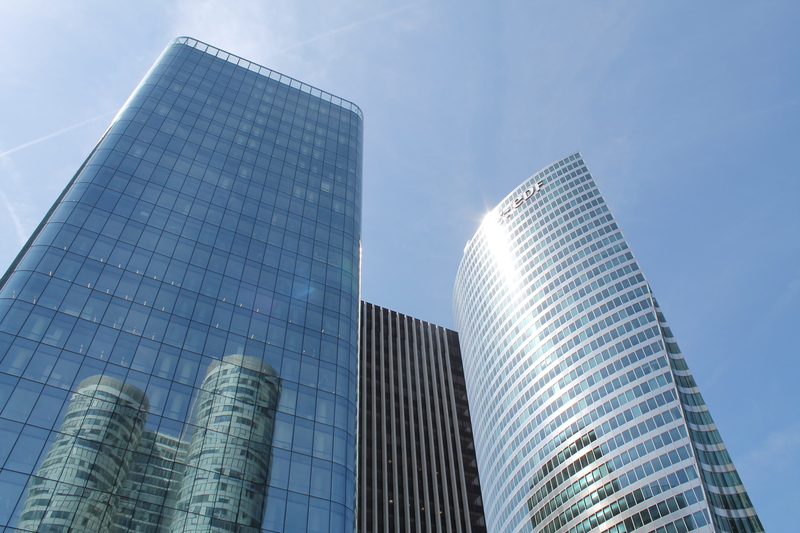 As if they were in a provençal village rather than this important business district that houses the headquarters of multinational giants such as TOTAL, EDF, Areva, Axa, GDF Suez and Société Générale, to name a few. 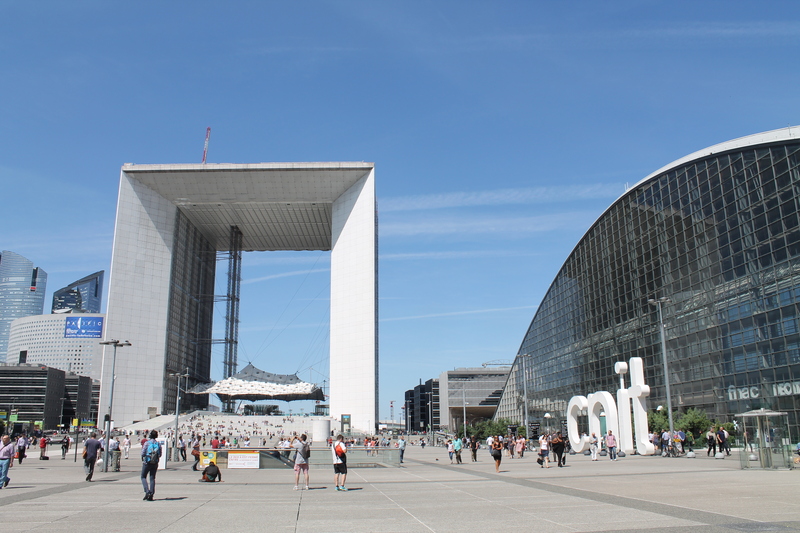 The further you walk towards La Grande Arche at the end of the Esplanade, the thicker and higher the buildings. But there’s still lots of open space. And lots going on. 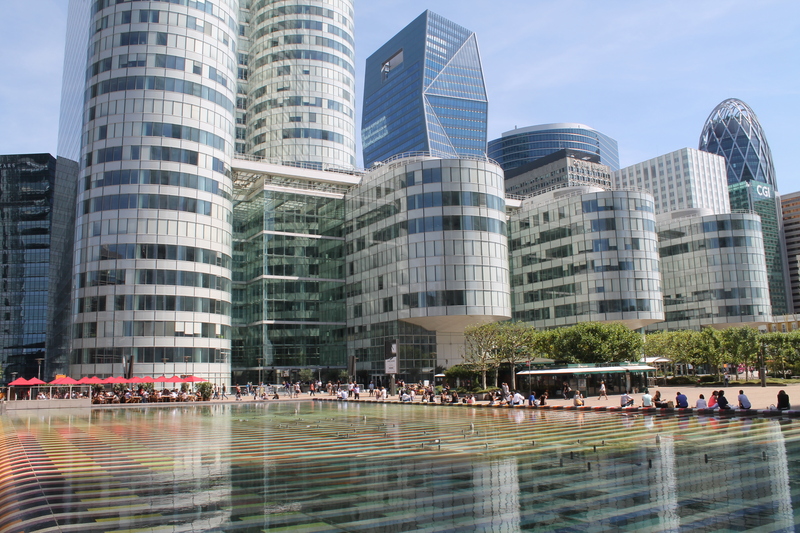 Some people dislike La Défense because of its concrete slabs and dehumanizing uniformity. They say the place is devoid of charm or soul. I happen to disagree. 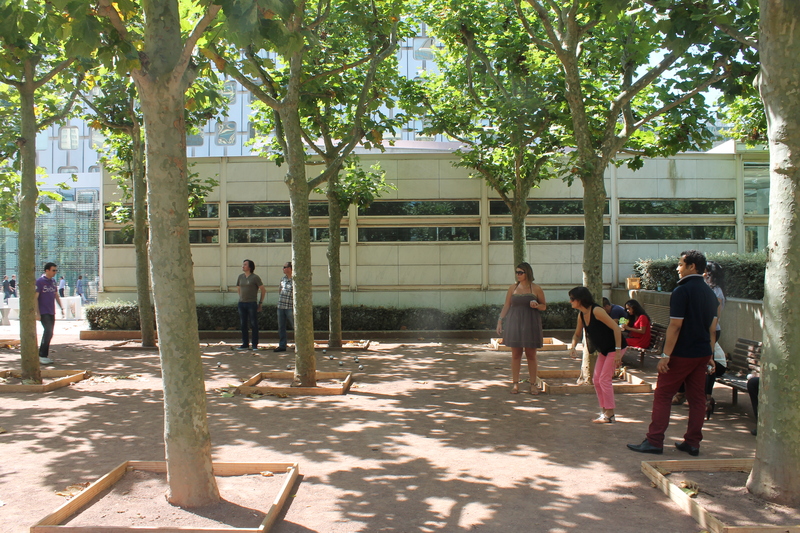 I find a poetic expression in the design of the urban space here. I think the planners have done an excellent job in humanizing the concrete landscape with the presence of outdoor art installations, grassy squares and benches, fountains (one which vigorously splashes up and down in tune with classical music played loudly on speakers), whimsical sculptures, seasonal markets, a summer jazz festival, etc. The best part though is the open space and absence of cars. 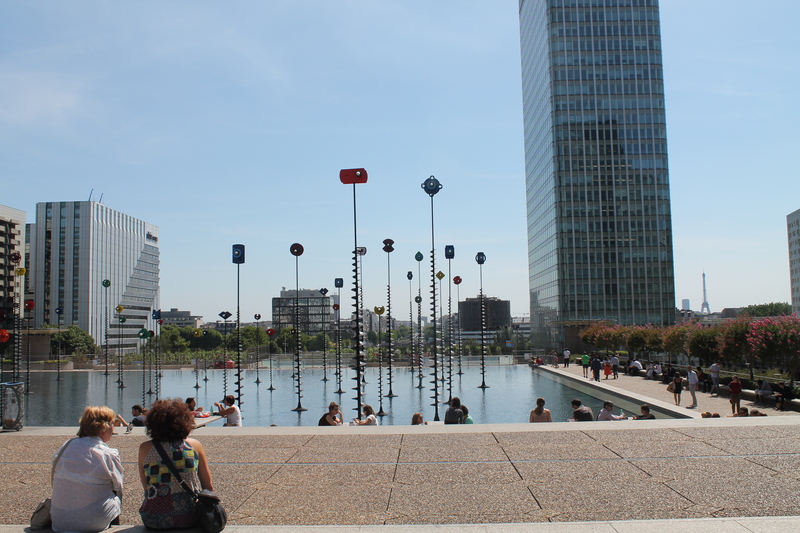 How to get there – take the central number 1 metro line to Esplanade de la Défense stop. 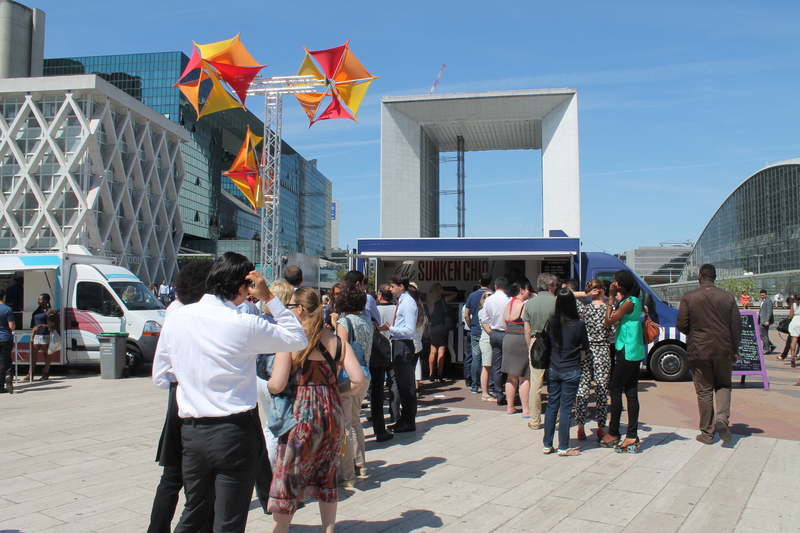 There are restaurants, shopping galore in the CNIT building or in the huge shopping mall called Les Quatre Temps complete with multiplex movie theater called the UGC Ciné Cité with 16 screens. 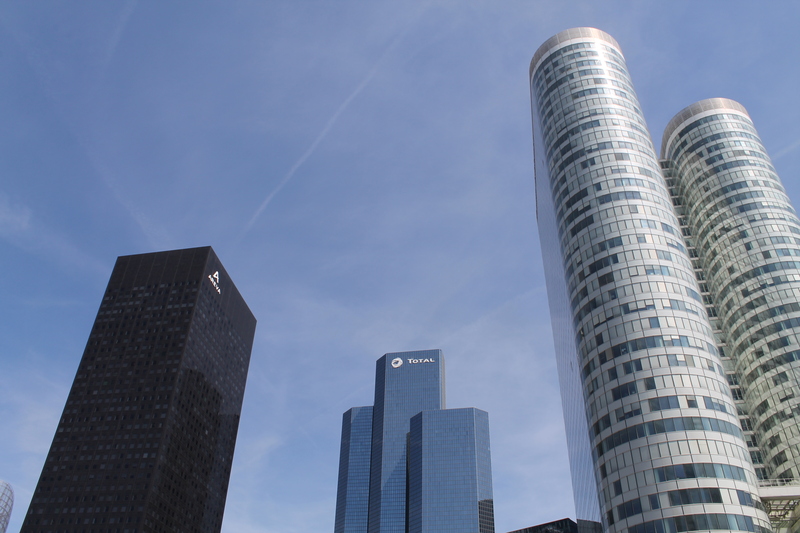 You can also take an elevator to the roof of La Grande Arche, the Danish-designed white cube, and look out at the stunning view. Word of caution – I would avoid walking around this area after nightfall.